I've always appreciated a hearty salad in the summer, but living in South Korea, I NEED a hearty salad in the summer. I need salad because it's not a hot meal nor a heavy meal and it fits summer perfectly. 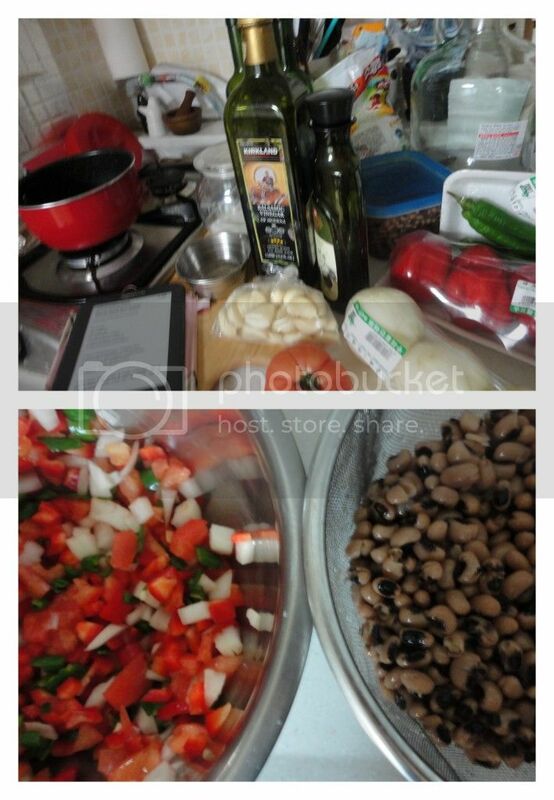 This Black-Eyed Pea Salad was delicious on it's own and absolutely fantastic served over/mixed with some brown rice. Prepare 1 lb. of dried black-eyed peas (I soak my beans over night in the slow-cooker, rinse in the morning, cover with water and cook on low all day, 8-10 hours). Drain and Rinse. In a small sauce pan heat up 1/4 cup Sugar, 1/4 cup Olive Oil, 1/4 cup Balsamic Vinegar, 1 clove of Garlic, minced and a shake of Black Pepper, heat until sugar has melted. Cool this dressing to room temperature. Meanwhile, combine the black-eyed peas with 2 Bell Peppers (Red and Yellow will yeild the most appealing salad), 1 Onion (again, red is preferred) and 1/2 cup chopped Celery if available. Toss with dressing and chill salad before serving!